June 1st was like any other day of unrest in Khan Younis, located in the southern Gaza Strip: Palestinians peacefully protesting were met with teargas and gunfire from the Israeli army. The protests, dubbed the The Great March of Return, or Great Return March, started on March 30, 2018, and were supposed to last six weeks. During the protests, Israel has wounded and killed many Palestinians, to the point that Gaza’s hospitals are “on the brink of collapse.” Amongst those Palestinians targeted by Israeli snipers have been media and medical personnel. 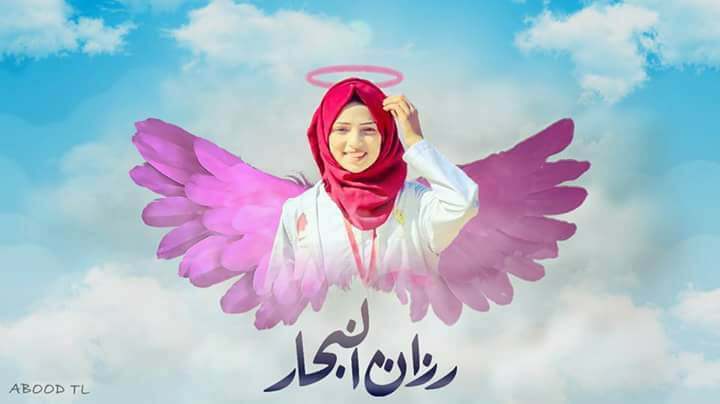 It was as she was running (with her hands held high in the air to show she was unarmed and not a threat) to help a wounded Palestinian that volunteer paramedic Razan Ashraf Abdul Qadir al-Najjar was brutally murdered. Say her name out loud and remember it. Al-Najjar was only 21 years old when she was fatally shot in the back by an Israeli Defense Forces sniper as she was treating wounded Palestinians. Protests have heightened ever since the relocation of the American Embassy of Israel to Jerusalem, the eternal capital of Palestine. These protests have been occurring amidst already harsh conditions created by Israel. It has come to the world’s attention that Gaza is becoming more and more inhabitable every day. Gazans live with scarce electricity and dirty water under war conditions. Razan al-Najjar works with a colleague to tend to an injured man at an emergency medical tent in the southern Gaza Strip. Around 7,000 Palestinians have been wounded, and Al-Najjar was the 123rd to be murdered. Ultimately, Al-Najjar is also a face for Palestinian women of all ages, especially young ones. In a New York Times interview, she said “Women are often judged. But society has to accept us. If they don’t want to accept us by choice, they will be forced to accept us. Because we have more strength than any man.” As such, more and more Palestinian women have been showing up at protests and protesting non-violently, when for decades, they were told to stay at home because of the dangers that entail protesting in the Gaza Strip, especially at the border of Rafah City. The world has been recognizing the power of young Palestinian women ever since the events that occurred with 17 –year-old Ahed Tamimi of Nabi Salih. Tamimi revived the image of Palestinian women at the forefront of Palestine’s liberation in a way the world hasn’t seen since the time of Popular Front for the Liberation of Palestine member Leila Khaled and peaceful protestor Naila Ayyash. Al-Najjar’s acts are the ultimate form of bravery, an impeccable example of patriotism and fighting for what one believes in. It was observed that she worked at the scene from 7 A.M to 8 P.M. She has seen a lot of hurt before her death. She also told Al-Jazeera, “It breaks my heart that some of the young men who were injured or killed made their wills in front of me, some even gave me their accessories [as gifts] before they died.” She claimed that she was not afraid of death, although she had been warned by a fellow medic that the site was obviously dangerous. Gaza right now needs all the medical help the city can receive, and Al-Najjar’s efforts were incredible. It has been reported that half the wounded have been shot with live ammunition; there are more cases than aid workers are capable of treating, and many wounded people have been left with permanent disabilities. The deterioration of the medical system because of the inhumane death toll is another reason for Gaza being uninhabitable. Al-Najjar was not the only paramedic to die in these events. Her fellow volunteer was fatally shot by an Israeli sniper. The world also has to say his name: Mousa Jaber Abu Hassanein. Israel claims they are looking into the deaths, but it is known that Israel doesn’t compensate Palestinians for their losses; there is no point in acting like Israel cares about the deaths. They continue in antagonizing Palestinians by moving the American embassy, building homes on lands past the Israeli border, and more. Then, when Palestinians protest, Israel acts like the victim when their agenda is clear. Israel kills these people with the excuse of Palestinians firing on IDF vehicles. Al-Najjar and Abu Hassanein were clearly marked as paramedics, wearing white coats, and the events are of pure injustice and genocide. Israeli media claims Israeli soldiers are defending themselves against “terror” groups according to “IDF regulations”. Al-Najjar and Abu Hassanein were not associated with any “terror” groups; the accusations are filled with bigotry. No paramedic, no innocents, and no people fighting for their right to return should die. Moreover, Razan Al-Najjar is more than just a paramedic in Gaza, as if that status was not heroism alone. She is a Palestinian and Muslim hero for everyone with a heartbeat. She is a martyr of the 70-year-old battle that will end only when justice is served. Razan Al-Najjar was reportedly fasting at the time of her death. Not only did she die in Ramadan saving lives in war, but she died on the blessed day of Friday. In Islam, those who die on a Friday, while doing good, and while fasting, are blessed with the best in the afterlife. May she rest in peace and live in the highest levels of heaven. Her funeral was held on Saturday, June 2nd. She will forever be remembered as a hero of the eternal struggle of Palestinians everywhere; the struggle of fighting to live in a safe place that is truly home. We are fighters and the people who wish suffering upon us and Palestine will never break our bond to our soil. May Palestinians everywhere return to worship freely in Jerusalem without the barricades Israel places around it. We are returning. To help Gaza purify their water through solar energy, please check out this link.